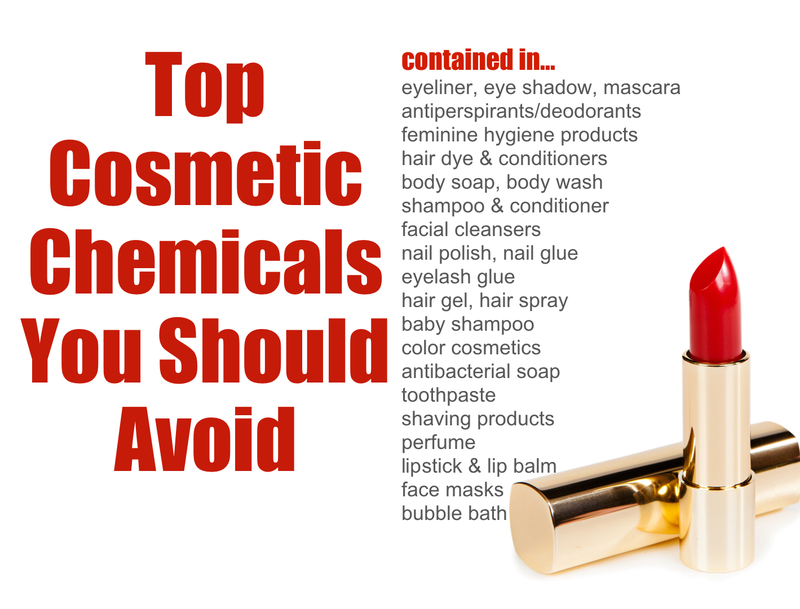 Cosmetics and personal care product labels give consumers no information about the toxicity of chemical ingredients. If the manufacturers were regulated by U.S. consumer protection agencies, which they are not, the label warnings would probably convince most people to think twice before making a purchase. There is also no restriction on the use of words, such as “natural,” “earth friendly,” “pure,” or even “chemical free.” Actually, there is no conventional beauty product that is chemical free! Even “organic” needs some clarification. You can use an organic label if all (100%) of the ingredients are certified organic, but you can also say “made with organic ingredients” if the product contains a minimum of 70 percent organic ingredients. 1. Parabens (methylparaben, propylparaben, butylparaben, ethylparaben): Used in shampoos, conditioners, lotions, facial and shower cleansers, and scrubs to prevent bacteria growth. Parabens are linked to endocrine disruption, cancer, and are developmental and reproductive toxins. 2. Formaldehyde: Used in nail polish, nail glue, eyelash glue, hair gel, hair-smoothing products, baby shampoo, body soap, body wash, and color cosmetics as a preservative. Formaldehyde has been identified as a known human carcinogen by many expert and government bodies, including the International Agency for Research on Cancer (IARC) and the United States National Toxicology Program. 3. Coal Tar: Used in shampoos, soaps, hair dyes, and lotions as colorants. Coal tar has been linked to skin tumors, as well as lung, bladder, kidney, and digestive tract cancer. It may also cause neurological damage. 4. Triclosan: Used in antibacterial soaps and detergents, toothpaste and tooth whitening products, antiperspirants/deodorants, shaving products, creams, and color cosmetics as an antibacterial. Triclosan may be harmful to a developing fetus and act as an endocrine disruptor, with a documented effect on the thyroid gland in particular. Moreover, studies have proven that antibacterial products, in which triclosan is often utilized, are no more effective than the application of soap and water. 5. Ethanolamine Compounds (MEA, DEA, TEA, etc. ): Used in soaps, shampoos, hair conditioners and dyes, lotions, shaving creams, paraffin and waxes, eyeliners, mascara, eye shadows, blush, make-up bases, foundations, fragrances, and sunscreens as emulsifiers and foaming agents. Ethanolamine compounds are linked to cancer and organ system toxicity. 6. Synthetic Fragrances: An almost universal component in personal care products, chemical-based fragrances are found in sunscreen, shampoo, soap, body wash, deodorant, body lotion, makeup, facial cream, skin toner, serums, exfoliating scrubs, and artificial scents. 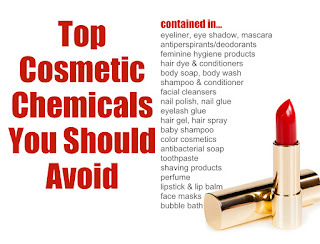 Thought not required to list their chemical compounds under a “trade secret” loophole, studies of chemicals in fragrances show links to cancer, endocrine disruption, reproductive toxicity, allergies, asthma and skin sensitivities. 7. Phthalates: Used in color cosmetics, fragranced lotions, body washes and hair care products, nail polish, and nail treatments to help the product cling to the skin (or to increase longevity). Phthalates are endocrine disruptors, as well as reproductive toxicants. The National Toxicology Program and the U.S. EPA also report that certain phthalates are likely to be classified as human carcinogens. 8. Chemical Sunscreens: (with Retinyl Palmitate, Oxybenzone, and Octyl Methoxycinnamate that may or may not be combined with mineral sunscreens), absorb ultraviolet light and are also absorbed by your skin. Potential health impacts include endocrine disruption and reproductive system toxicity. 9. Talc: Used in baby powder, body and shower products, lotions, feminine hygiene products, eyeshadow, foundation, lipstick, deodorants, and face masks as an abrasive, an absorbent, an anti-caking or bulking agent. Talc can cause respiratory irritation if inhaled. Perennial use of talc has also been classified as possibly carcinogenic by the International Agency for Research on Cancer (IARC). 10. Sodium Laureth Sulfate: Used in foaming cosmetics, such as shampoo, cleanser and bubble bath as a surfactant, detergent, and emulsifier. Sodium Laureth Sulfate may cause organ system toxicity, as well as skin, eye, and lung irritation. 11. 1,4-Dioxane: Found in foaming personal care products, such as shampoo, baby shampoos and body washes, liquid soap, bubble bath, and hair relaxers, 1,4-Dioxane is a byproduct of certain cosmetic ingredients, including detergents, foaming agents, emulsifiers, and solvents. It is considered a probable human carcinogen by the U.S. EPA. 12. Benzophenone & related compounds: Used in lip balm, nail polish, foundations, baby sunscreens, fragrance, shampoo, conditioner, hair spray, moisturizers, and foundation as a fragrance enhancer and as an ultraviolet light absorber and stabilizer. California EPA’s Proposition 65 list identifies benzophenone as a possible human carcinogen. Benzophenone may also lead to endocrine disruption, developmental and reproductive toxicity, organ system toxicity, and irritation. 13. BHA and BHT: Used in lip products, hair products, makeup, sunscreen, antiperspirant/deodorant, fragrance and creams as a preservative. BHA has been classified as a possible human carcinogen by the International Agency for Research on Cancer (IARC), in addition to being linked to endocrine disruption. Exposure to BHT has been linked to liver, thyroid, and kidney problems in mice and rats. 14. Hydroquinone: Used in skin lighteners, facial and skin cleansers, facial moisturizers, hair conditioners, and nail glue. Banned in the EU, hydroquinone is linked to cancer and organ-system toxicity. 15. Lead and other heavy metals: Used in lip products, whitening toothpaste, eyeliner, nail color, foundations, sunscreens, eye shadows, blush, concealer, moisturizers, and eye drops. Exposure to metals could lead to reproductive, immune and nervous system toxicity. 16. Paraphenylenediamine (PPD): Used in hair dyes to achieve a particular color of dye and to bind that color to the hair permanently. PPD has been linked to skin sensitization, cancer, mutagenicity, and organ system toxicity. 17. Petrolatum: Used in hair products, lip balm, lipstick, and skin care products as a barrier to lock in moisture and to make hair shine in hair care products. It has been associated with cancer, skin irritation, and allergies. 18. Polyethylene Glycol (PEG): Used in conditioners, moisturizers, and deodorants as thickeners, solvents, softeners and moisture-carriers. PEG may be contaminated with compounds that are possibly carcinogenic to humans and may cause organ system toxicity. 19. Siloxanes: used in moisturizer, makeup, and hair products to soften, smooth, and moisten. Siloxanes are possible endocrine disruptors and reproductive toxicants. 20. Toluene: Used in nail polish, nail treatment, and hair dyes as a solvent to dissolve other substances, such as resins and plasticizers. Toluene has been linked to developmental and reproductive toxicity, organ system toxicity, and irritation.